Home & Farm Appliances. You may also like. 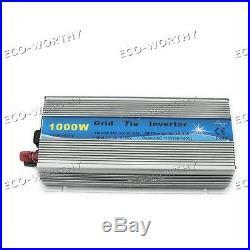 1KW DC12V-AC110V grid tie inverter for home solar panel system MPPT Function. Pure Sine Wave Output. Fed the power to city net. No battery for solar system anymore, really environment friendly. Wide range input voltage. Reverse your power meter cut your bill. Max power point tracking function. Recommend solar panel power. Max input DC power. 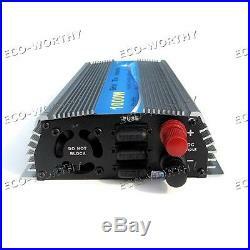 Max Output AC Power. AC Output Voltage Range. AC Output Frequency Range. DC Input Voltage Range. Total Harmonic Distortion(THD). Output short circuit protection. 0-99%(indoor use only). Red terminal: Connect DC positive, black terminal: Connect DC negative. AC socket: Connect to the mains. Put the side of the AC cord which has holes into the. With 3 foot outlet and the other side of the AC cord to home 3PIN AC outlet. 3Switch: Connect the connections in right way, then turn on the switch. The inverter starts to work. Please pay attention of the voltage when use the product. 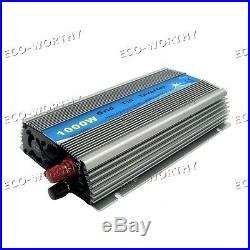 The voltage is from 10.8-28V, if is not these voltage the product may broken. Non-professionals do not disassemble. Only qualified personnel may repair this product. Please install inverter in the low humidity and well-ventilated place to avoid the inverter over-heating, and clear around the inflammable and explosive materials. When using this product, avoid children touching, playing, to avoid electric shock. 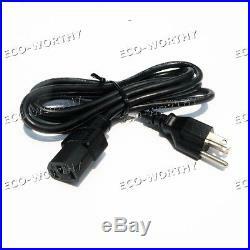 Optimal length of the DC input line 8M or less, long cable will allow solar panels to the inverter. DC voltage drop caused by wear and tear. Connected to a power outlet to provide AC. 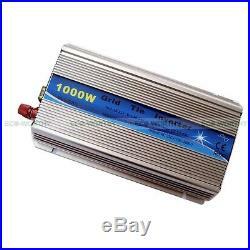 Our this inverter is only suitable for solar panels, notsuitable for Wind Turbine. 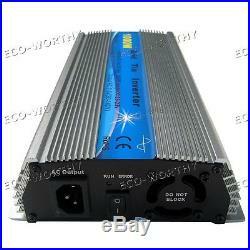 Our this inverter is only suitable for 18v solar panels andonly for 12v system. 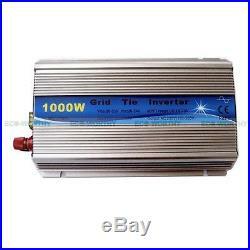 1 piece 1000W 12V 110V Grid Tie inverter. For the remaining details. Goods stocked in USA, goods will be sent by UPS. For USA customers the most important thing. Whenever you feel confuse or. Trouble, please don’t hesitate to let us know. We will try our best to help you at once we receive you message. We strive to serve our customers and resolve any issues. If your shopping experience with us is anything less than five stars, please. We appreciate the opportunity to correct any issues you have before you leave feedback. We do appreciate your consideration and looking forward to doing business with all the customers and companies. We are manufacturers and wholesalers of solar panels and renewable energy products. Our solar business has been established since 2002. OEM and ODM services are both available. We would like to be your best supplier in China. We will reply you within 24 hours, or please note the auto-replied messageses. Public holidays in China is not available for message reply. 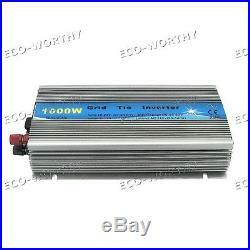 The item “1KW DC12V-AC110V Grid Tie Inverter For Home Solar Panel System MPPT Function” is in sale since Monday, June 13, 2016. This item is in the category “Home & Garden\Home Improvement\Electrical & Solar\Alternative & Solar Energy\Solar Panels”. The seller is “ecoworldenergy” and is located in Rosemead, California. This item can be shipped worldwide.